SlickRun is a floating keyword utility that allows you to create command aliases, or "MagicWords" that launch applications or URLs. For example, "browse" can be set to open Firefox, "note" to open Notepad, and more. You can type an application's path or location as well. The program includes its own notepad program opened by typing "jot", but major applications such as MS Office and Online Shopping resources can be added using add-on packs available on the website. SlickRun supports auto-completion, relative paths and drive letter macro for improved portability. Stealth: ? No. It creates a lone working registry entry that does not impact portability of settings at all. Unicode support: Yes. for Jot, history, autocomplete, $W$, etc. Note that the x32 build (sr-setup.exe) is still at version 4.3.3.2 while the x64 build (sr-setup64.exe) is at version 4.4.0.0. The latest version of SlickRun is 4.3.0.1. SlickRun 4.2.5.3 released, now there are both x32 and x64 versions available as separate downloads. Those runtime libraries haven't been needed in SlickRun for a long time; they are now embedded within the program. You do make a valid point about Universal Extractor not working, this needs to be looked into. For now you can use 7-Zip to extract. (sr.exe, DefaultMagic.qrs, 3x .wav files, uninst.exe). 3. Copy 3 Delphi runtime .bpl files from Windows system folder on the "slickrun" dir. What is the purpose of your comment; you obviously didn't even download and run SlickRun. 1. It doesn't require any other files to run, it runs from a single executable. 2. IIRC last time I used Executor it too comes with some pre-made links (aliases). 3. When you create an alias (Magic word) in SlickRun, you do not need to type the exact word, you only need to start typing, e.g. if you have three magic words that begin with 'C'; calculator, ccleaner compressor, when you type 'cc' 'ccleaner' fills the box. One thing that bothered me with Executor was, if I had many aliases/shortcuts beginning with the same letter, Executor would populate the list alphabetically where as SlickRun would show the last "Magic word" I used by typing a single letter. So if I have calcute, capture, cathy, ccalc, ccleaner, chrome, etc... and I launch 'chrome' the next time I type 'c' in SlickRun it will show 'chrome'. You can get similar results from making renamed shortcuts to programs you like to use and placing them in a folder that is scanned by Executor (looking for .lnk files). Executor doesn't require any other plugins or installations or junk to install and it doesn't come with pre-made aliases. You can use Executor to scan for any file type(s) you want. And you don't have to type the exact words either. I've been test-driving this for a couple of months and liking it pretty well. Seems to be lighter on RAM/CPU usage than Launchy, Executor, and FARR with indexing service. My needs are too simple to need indexing. Using SlickRun in combination with my custom quick-launch toolbars in FreeCommander has me covered. Defining new "magic words" takes the tiniest bit of effort, and I think worth it. Instead of drag&drop a target onto the settings dialog, you can open your target file and drag the "appPainter" dropper onto the target window to load that link (think of it as reverse drag&drop). Or you can browse to select a target file/program (click on blue link "Filename or URL", it's not just a label) or type/paste a path or URL. After loading a bunch of links, I exit and open the settings file Slickrun.SRL in Notepad and do search&replace to replace drive-letter with the $D$ drive-macro (thanks to RUBY for clarifying that point). I don't worry much about relative paths, but using something like Replace Absolute Paths http://www.portablefreeware.com/index.php?id=1769#comments would make it easy to adjust the SRL settings file for relative paths. The help file is very good, and **Bonus Points** to SlickRun for displaying date/time in the command-bar, so I can dismiss my systray clock and gain some precious taskbar space. The simplicity of words used to launch programs and web pages rather than some kind of menu system because you think of the verb of something you want to do before you think of the program that does it. As such, SlickRun translates into a real productivity boost. Although initially the program seems complex and unapproachable, just a little customization becomes infectious and you find you've developed quite a list of words. SlickRun is my favorite launcher and in my startup folder, but looking back to the debate between Andrew and Erik it seems there was and still is a path issue. 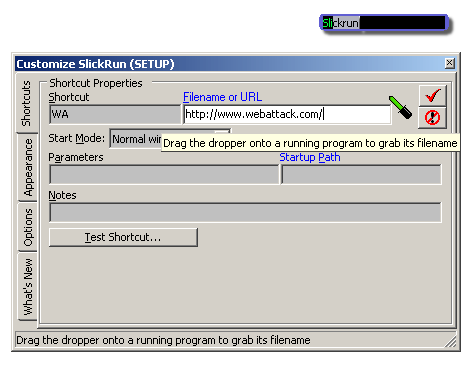 It has to do with how you start SlickRun (ie: command-line, shortcut or double-click the exe). Andrew stated in one of his comments "If the launcher forgets to use SetCurrentDirectory() to point to its own base folder, then relative paths will fail. ", which is exactly what happens when you start SlickRun from a command-line outside of it's own folder. SlickRun is a true command-line program and will retain the current directory of where it was started from. The problem is further compounded by the fact that when assigning a magic word and a corresponding file, that file is now working in the current directory that SlickRun is working from. To overcome these issues and assure path portability, first and foremost start SlickRun by either double-clicking the exe inside it's folder or from a command prompt, cd to SlickRun's folder and then launch. Now create a MagicWord and browse for a file, then replace the drive letter and colon with the drive macro "$D$" (without quotes) and set your Startup Path for this file relative to SlickRun (ie: ..\Regshot). If you do not set this path some files (ie: Calcute, LBreakout2, Regshot, WinSCP) will write their settings back to SlickRuns Working directory. The $D$ macro filepath will always work no matter where SlickRun was started from whereas the relative filepath will not. To see your current working directory type cmd in SlickRun command box. I've been using TypeAndRun for some time. How does this compare to it? Dude, for me, this is a almost useless piece of software... there are few already defined "magicwords" and new definitions cost me a lot of time. Outstanding keyboard application launcher. I've used pretty much all the others, but this one really does a fantastic job. Highly recommended! SlickRun support relative drives and relative paths and is an ideal part of your portable usb kit. @ Erik: could you show one or two magicwords that fail? "with an error that I:\whatever prog does not exist"
Notice that the error message has no drive letters at all. Strange to hear Erik that SR won't launch apps with relative paths for you. I did some test here and everything works fine. I definitely tried it before posting my last comment, and it worked for me. Perhaps someone else would like to verify the method. Thanks! Adnrew, this discussion would have been MUCH SHORTER if you would just TRY what you are saying, instead of continuing to just say it, because IT DOES NOT WORK with magicwords. I don't "really, really, really want relative drive letters", i would just like to use slickrun for driving 200 portable programs on a jump drive, but it doesn't work as delivered. I wrote a work around, and it works fine with the workaround. If you have some way to make magic words work when the jump drive letter changes, then post it, but TRY IT FIRST. BTW, Eric, if you really really really want relative drive letters, here's a simple way to do it. Just delete the drive letter in the MagicWord. eg. if the path is "f:\photofiltre\photofiltre.exe", just change it to "\photofiltre\photofiltre.exe". That way, it doesn't matter which drive letter the USB memory stick got assigned. The program will still run. Note that this method doesn't just work with SlickRun. It should work with any launcher that supports relative paths, since relative drive letters is but a subset of relative paths. Actually, not every launcher supports relative paths. If the launcher forgets to use SetCurrentDirectory() to point to its own base folder, then relative paths will fail. I have seen a couple of launchers that don't support relative paths. everything will still work without any change. If you use relative drive letters, you will still need to change every app path involved. Of course, it will be better if the launcher converts all absolute paths to relative paths automatically, like PStart. It also wouldn't hurt if the launcher supports relative drive letters, but given a choice, I would rather the launcher supports automatic relative paths _first_ due to the benefit I have described above. btw, Andrew, the relative path usage you refer to is not what slickrun is referring to. EVERYTHING supports that kind of relative path, because it is a built-in function of the O/S. It has been built-in since early dos. For an author to say he supports that kind of relative path usage would be the same as saying he supports folder structures. duh, so does everyone else. Dude, try setting a magicword for some program on the jump drive. Then plug it in somewhere else where the jump drive letter changes. This is a site dedicated to portable software. What's the point of having a program that starts other programs when it won't start other programs on jump drives? And don't lecture me on relative paths. Relative path has been used loosely lately, in the context of portable programs and jump drives, to refer to changing the jump drive letter when it is plugged into a different computer, which slickrun does not do. So slickrun will not start programs off a jump drive when a different drive letter is assigned to the jump drive. There is a work around, which involves using dos' subst to force a fixed drive letter to the jump drive. I've got it working with an Autoit script if anyone is interested. Then you specify "..\photofiltre\photofiltre.exe" when you define your MagicWord (relative to where SlickRun.exe is, you see), you can run it from anywhere and it will still work, as along as the folder structure remains the same. Hell, you could even copy it to your friend's harddisk under C:\MainFolder\SubFolder\WhySoManyLevels and it will still work! That's the beauty of relative paths. Ok,Andrew, what am i missing? I setup magic words on computer A, which is jump drive letter I:. Now I move to computer B, which assigns J to the jump drive. Now all the magic words fail, with an error that I:\whatever prog does not exist, do I want to edit the magic word. You have some way to make this work? I can confirm SlickRun does support relative paths as indicated in the synopsis. seems to suggest SlickRun does support relative paths? GREAT PROGRAM. Been looking for this for a long time. Allows access to progs by multiple words in case you don't remember what the prog name was, but you do remember it was a "network" or "scan" or etc.